Yesterday saw the big showdown of the Tour on its final climb. Two great climbers in Alberto Contador and Andy Schleck rode man-on-man up one of the most famed climbs of cycling, in thick mist, in a battle that many felt would decide the yellow-jersey. In the end, it won’t, with a time-trial to go and two riders who were inseparable on the climbs. But it was an epic day, and produced some epic performance. To wet the appetite, some interesting estimates of power output emerged yesterday. First, for a really methodical, and I believe quite accurate method of ESTIMATING the power outputs, check out Cozybeehive, where Ron has analysed the climb segment by segment. This method of estimating the power output relies on using the rate of vertical ascension, or VAM, which can be calculated if you know the distance and the gradient of the climb. And herein lies a problem – there are many discrepancies in how these climbs are ‘mapped’, and this affects the value you calculate. Also, wind, drafting and changes in the grade also affect the final estimated power output. There’s been some pretty strong criticism of it, but so far, comparing the estimates to the actual SRM data has produced quite similar values, rarely different by more than 0.2W/kg. On the note of distance, yesterday, the 18.6km to go banner for the start of the climb was almost certainly in the wrong place. It took the peloton a full 4:42 to ride from the 20km banner to the 18.6km banner (speed of 18km/h), and that was before the climb. Once on the climb, the first 3.6km took six minutes, a speed of 36km/h. In otherwords, if you believe the banners, then you believe that the speed doubled once the climb began. I don’t, and so my conclusion is that the banner for the start of the climb was late by about a kilometer (this is further seen in the on-screen TV distances, which aren’t always accurate, but they said 17.6km to go – I believe this). So anyway, the point is that what you calculate varies quite a bit as a result of this. Ron has estimated that the power of Schleck and Contador over the final 8km was 6.0 W/kg. I think this is close, but likely a small overestimate, because of drafting effects. My overall estimation is that they took 49:08 to climb what I believe to be the final 17.6km at a gradient of 7.6%. This gives a VAM of 1,633 m/hour, and a relative power output of 5.9 W/kg. 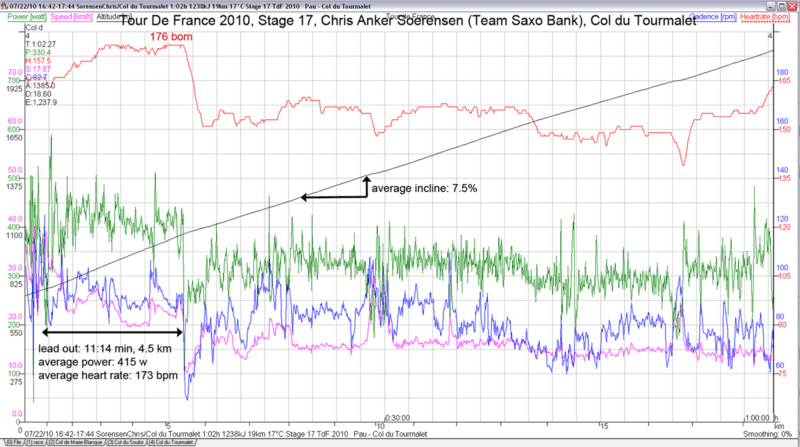 The graph below shows Chris Anke Sorensen’s power from the start of the final climb. If you recall, Sorensen set the climb up with an incredibly hard pull over the first 15 or so minutes. So a massive pull – 415 W or 6.6W/kg, for 11:12, before Sorensen’s day was up, and he dropped down to closer to 310W for the rest of the climb (also, note that the speed ranged between 20 and 25km/h, not 36km/h, which further suggests that the climb was marked incorrectly for TV purposes). The gap between Horner and the leaders remained relatively constant over the final 5 km of the climb. 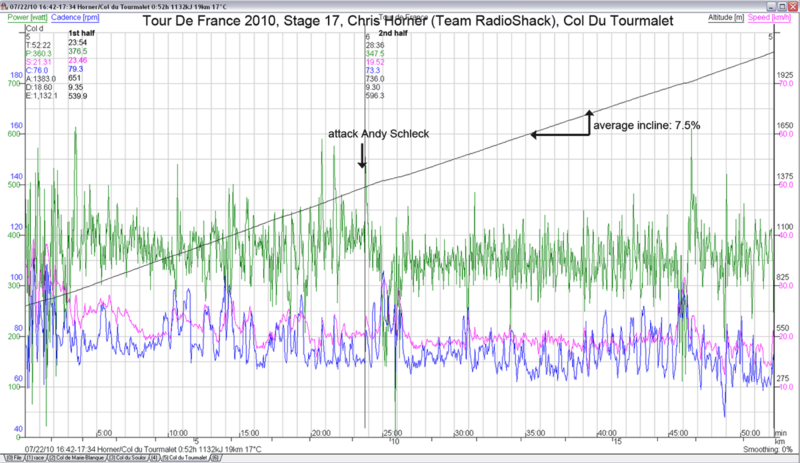 When Schleck attacked, the time gap grew relatively quickly to one minute, but then it edged up to 1:30, before actually staying in the range of 1:35 from 4km to go until the finish line. Therefore, it’s useful because Horner’s power output in the final 5km will be very similar to what was produced at the front of the race. After the attack came, Horner completed the climb at 348 W (5.4W/kg). Horner’s overall average power output on the climb was 360 W, or 5.6W/kg. Interestingly, if you use the VAM method for Horner, you calculate a power output of 5.7 W/kg. Therefore, I am quite confident in saying that Contador and Schleck probably averaged 5.9W/kg over the entire climb. So, a fascinating graph and insight into the Tour’s big day. But what does it all mean? Before the Tour began, there was a great deal of debate about what the performances tell about physiology. I suggested that the power outputs of the 90s and 2000s, where these climbs were frequently done at 6.2, 6.3 and even 6.7W/kg, were a sign of doping. You may recall the notion, developed by Dr Ferrari and communicated by Armstrong in his book, that they aimed for 6.7W/kg as a threshold climbing output. And the top two climbers yesterday arguably rode at around 6.0 to 6.2W/kg for the first half of the climb, but their power output dropped off in the second half (which we know, because the time gaps ceased to grow over someone who was producing 5.5W/kg). What is the physiology of riding at 6W/kg? If a cyclist has an efficiency of 24%, then the VO2 at 6W/kg is about 71 ml/kg/min. If this represents 85% of a maximum, then a VO2max of 83 ml/kg/min is estimated. If the efficiency is 23% (measured by Coyle for Armstrong in 1999), incidentally, then the VO2 is 74ml/kg/min and the estimated max would be 87 ml/kg/min. Neither jumps out as not-seen-before-physiology. But, if you go up to 6.2W or 6.3W/kg, then it starts to become, well, questionable. Horner, incidentally, riding at 5.6 W/kg, would have an estimated VO2 of 66 ml/kg/min. Compare the estimates of power output this year to previous years (again, they’re consistently 5 to 10% down), you arrive at the same point – it’s a slower Tour. Now, tactics are of course important. Many of you have argued this, and of course you’re correct. Race situation dictates who attacks, when they attack and how they ride. That’s why you need many climbs, and not a single one, to reach a correct conclusion. One Tour provides many climbs, and I think there’s still huge value in this year’s numbers. However, because it’s still a small number, this is a hypothesis, not a finding – what would be fantastic would be to track these stats over the next ten years, and compare the 90s to the 2000s to the 2010s. And also, to look at averages for top 10, top 50, top 100, to get an idea of depth. Yesterday, on the Tourmalet, there were tactics – ride as hard as possible. 6.6W/kg from the bottom, followed by an attack, and I don’t see any signs of ‘hedging’ of physiology on the day. It was as hard as was possible at that stage in the Tour, and I would continue, then, to hypothesize that the more stringent doping controls, the biopassport and the scrutiny on the sport have helped bring it down. Call it “physiologically believable” (which many don’t like, but I use it with its obvious intention), or call it signs of change, I do believe that the Tour is slower, and that the days of 6.3W/kg for 40 minutes are now the stuff of highlights and commemorative DVDs. A massive time-trial to come, where the Tour will be decided!